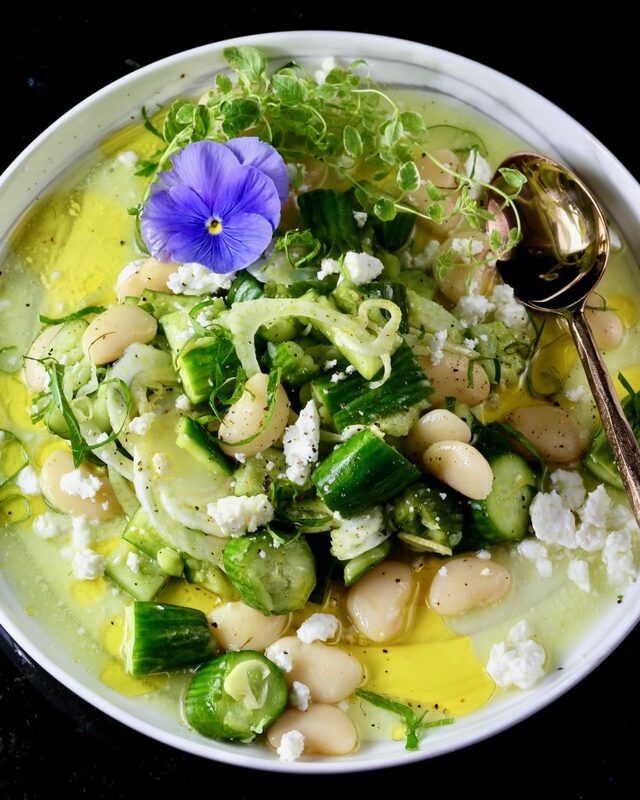 Cool-crisp Persian cucumbers and creamy-buttery lima beans make a delightful summer duo. Fennel adds a bright crunch with a sweet, nutty anise flavor. The large limas by Lompoc Beans are sold at our local Torrance Farmers Market. They are also available online. Grown in Santa Barbara County, the beans cook up beautifully smooth and tender. Soak 2 cups of beans in water for 4 1/2 hours then drain. Place beans in a pot and add fresh cold water to cover by 2 inches. Add 4 smashed garlic cloves. Bring to a boil then turn down to simmer, cook uncovered, for one hour. Stir occasionally and add more water if necessary. Cook al dente (soft but not mushy), taste a few beans for doneness. Drain. Set aside to serve at room temperature. It’s a fun salad to compose. Put cucumber chunks in a roomy ziplock bag and smash with a mallet. Squeeze lemon juice and drizzle fruity olive oil into the bag. Add shaved fennel and toss the bag to coat the veggies with the dressing. Let marinate for 10 minutes. Dump the ziplock bag contents onto a rimmed serving plate. Arrange beans around the cucumbers and fennel. Sprinkle crumbled feta on top. Drizzle a bit more olive oil over the salad. Garnish with fresh mint chiffonade and oregano. Season with salt and pepper. A single edible flower in a contrasting color from the garden makes the presentation pop! 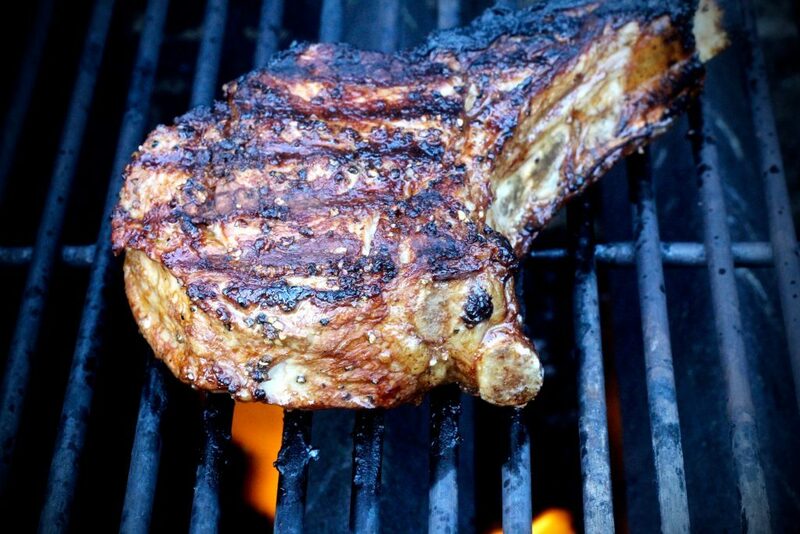 We served this salad with awesome Grilled Veal Chops, recipe here. And here’s another perky Smashed Cucumber recipe. 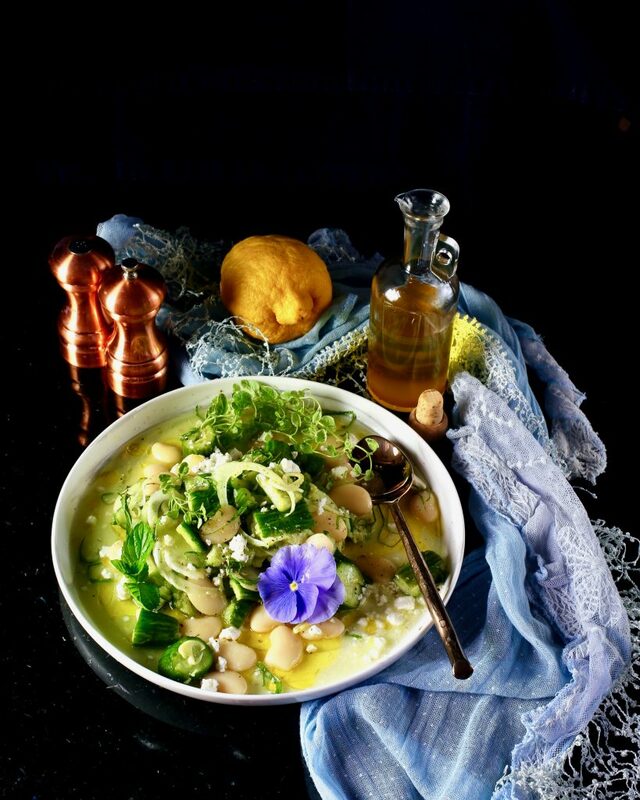 *A photograph in May 2018 Food and Wine magazine that paired cucumber with butter beans was the inspiration for this refreshing summer salad.